Isn't she a beauty? 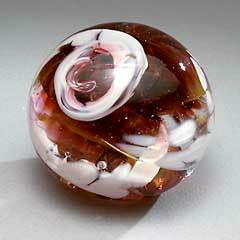 2 5/8" paperweight. Swirls of brilliant colors wrap up to a flower like point encasing a bubble. You can see layers of color with ripples of intensity going through the ball with wisps of the clouds wrapping around the outside. I'll get the photo of it on the light stand soon, and then post that too. It's just doggone GORGEOUS on a light stand, and pretty enough on it's own in the sunlight. We recently got a commission to make a set of marbles and in doing so, BJ went wild and started making these much larger paperweights. We had a very great time creating these, and most of them turned out magnificent. Of course, some of them got a little mutant shaped -- there's just no fighting hot glass when it wants to go a different way! We'll be posting them on a new website soon for sale, and also offering them on ebay. This one will be $175. Mention you saw it here and get a discount. Now that it's dark, I'm going back to the photography and get the light stand version of this! WooHooOOooo!! !